Searching for day trips from Leeuwarden, Friesland – The Netherlands? Don’t worry, I will help you with the best places to see and visit in Friesland. You are going to spend a few days in Leeuwarden, Friesland and am looking at day trips you should take from Leeuwarden, The Netherlands? You’ve come to the right place. In this article you will also find things to do and what to see in Friesland. You might ask yourself, where is Friesland, The Netherlands exactly? Friesland is a province in the North of The Netherlands. Friesland is famous for having its own language, Fries (Frisian), the 11-cities (one of them is Leeuwarden), and for having lakes and rivers everywhere. Seriously. More so than the rest of The Netherlands. And for anyone who is wondering, Leeuwarden is the capital of the province Friesland. Friesland has many points of interest, even if you are not that into the water, so don’t worry. Here you will find the 19 destinations in Friesland, The Netherlands that I think you should visit. Keep in mind that Friesland, as a province, is an off the beaten path province within The Netherlands. So, you won’t find that many tourists in this beautiful province, yet, but plenty of tourist attractions can be found in Friesland. 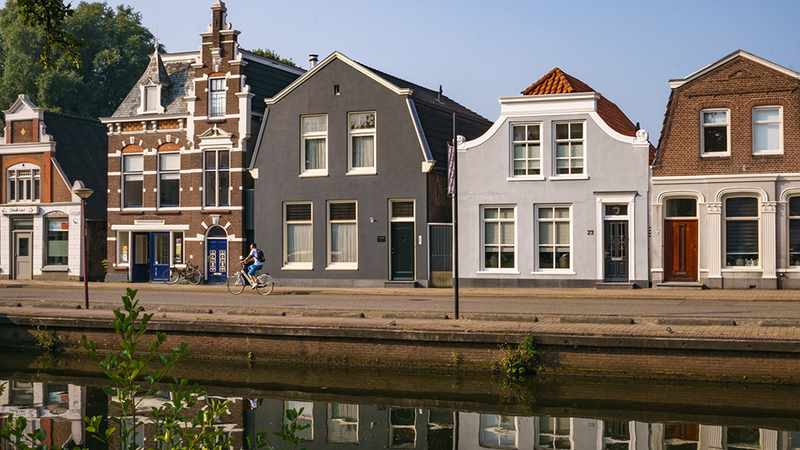 Leeuwarden has many things to do and is easy to reach from big cities, such as Amsterdam, by train. But, you would be missing out on the great things you can see in the rest of Friesland, The Netherlands. That’s why here you will find the best day trips from Leeuwarden, The Netherlands. Sloten is a wonderful day trip from Leeuwarden, where you will feel like you entered the 16th century again. It is a quaint city that originated in the 13th century and acquired borough rights in 1426. A big part of the smallest city of Friesland has acquired the monumental status. It is also one of the 11 cities of Friesland, these are the eleven cities of Friesland that got borough rights. This is also what the 11 cities ice skating tour is named after. Sloten is one of the places you should visit when you are in The Netherlands. I have to admit, this town is small with only 760 inhabitants, yet there are plenty of things to do in Sloten, Friesland. The fact that the city is so small, makes you feel oddly at home especially if you’re from a smaller town or village like I am. The streets are incredibly cute and the view across the small city from the bridges is beautiful. It is so calm in Sloten that you can sit at the edge of a canal for hours and not feel disturbed by people (yes, I did that. No shame.). The best way to get to Sloten is by taking the intercity train in the direction of Den Haag Centraal from Leeuwarden train station. Get out at Heerenveen station. Take bus 41 in the direction of Balk from Heerenveen bus station (in front of the train station, but not on the parking lot side!). Get out at Sloten. This will take you a little over an hour and is the simplest way to get to Sloten, Friesland. 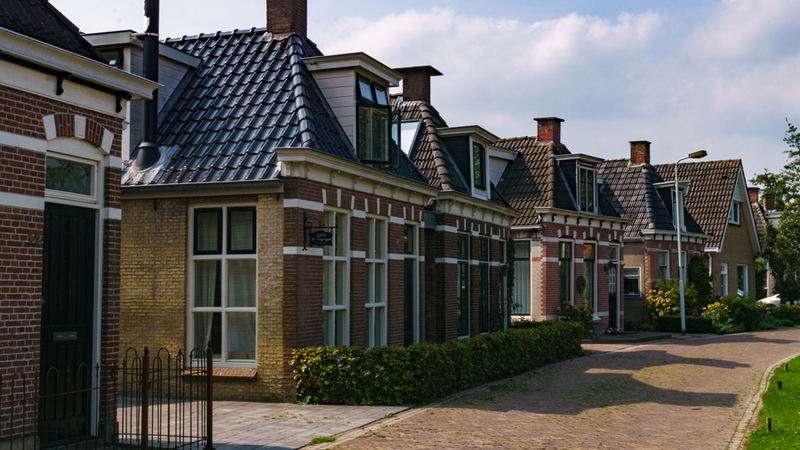 Do you want to know more information about Sloten, Friesland? 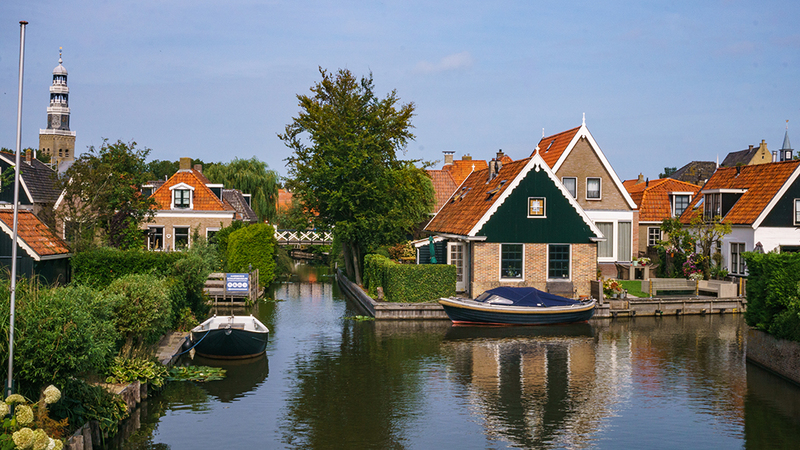 Click here for all the information you need to enjoy a day in Sloten, Friesland. Lemmer, Friesland is famous for the Woudagemaal. This is the biggest and oldest steam pumping station that is still workingin the world and one of the several Unesco world heritage sites in the Netherlands. Click here for an article about the Woudagemaal. 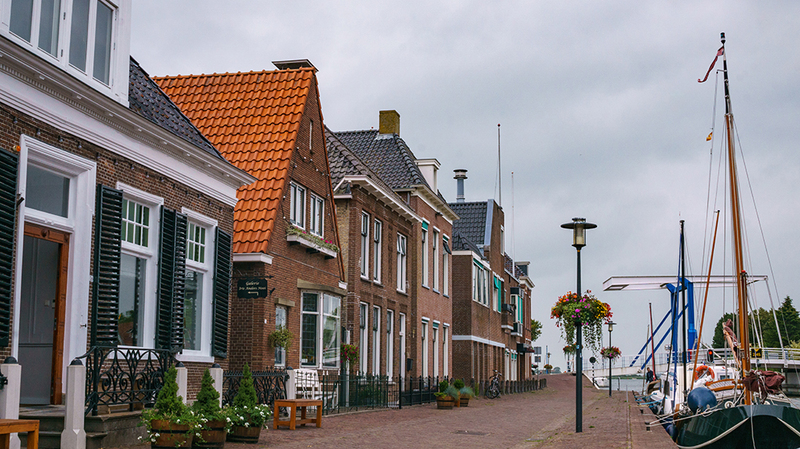 Besides that, Lemmer has plenty more to offer, as a city that has existed since the 13th century, one of those things are beautiful streets. One of those things is the beautiful beach. Lemmer is located on the Ijsselmeer and during the summer you will see many people on the beach and in the water. When the wind takes off you will see people kitesurfing or windsurfing. And then, once you’re done with that, you can relax at the beach club or go back into the old city to sit on a terrace and enjoy the canals. The easiest way to get to Lemmer from Leeuwarden is by taking the train in the direction of Stavoren from Leeuwarden train station. Get out at Sneek. From Sneek station take bus 42, in the direction of Lemmer and get off the bus at Pampusstraat, Lemmer. This will take you a little over an hour. This city has a little over 10.000 inhabitants, has a rich history and is another one of the 11 cities. Bolsward in Friesland, The Netherlands is so quiet. But in a good way. The city is bigger than Lemmer and even more beautiful. You can walk for hours and not get bored here. There are many events throughout the year, great places to eat at and the people are very friendly. I am used to saying ‘hallo’ to everyone in my village and surroundings. I’m not used to saying this to people within cities, yet, this one is different. I heard ‘hallo’ wherever I was walking. If you are bored of walking around you can take a canal tour or take a seat inside or outside the many cafes that Bolsward has. That has made this city one of the best day trips I have ever taken from Leeuwarden, The Netherlands. You can either take bus 92 from Leeuwarden bus station in the direction of Bolsward, get off at Laag Bolwerk, Bolsward. Or you can take bus 192 in the direction of Bolsward, get off at Laag Bolwerk, Bolsward. Both rides will take you anywhere between 30 minutes and 40 minutes. 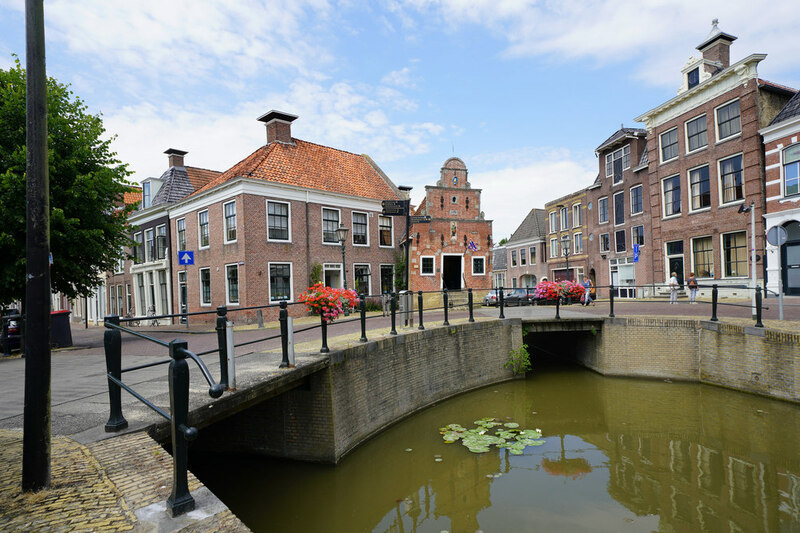 Do you want to know more information about Bolsward, Friesland? Click here for all the information you need to enjoy and explore Bolsward, Friesland. 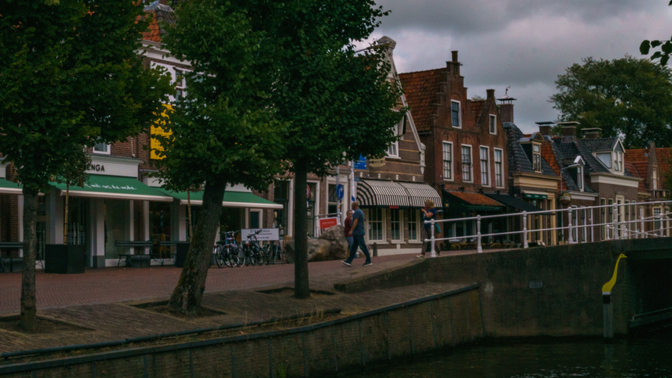 This city is another one of the 11 cities, and if you walk inside the city you can imagine why this is one of my favourite cities of Friesland. It feels rough but authentic and old at the same time. 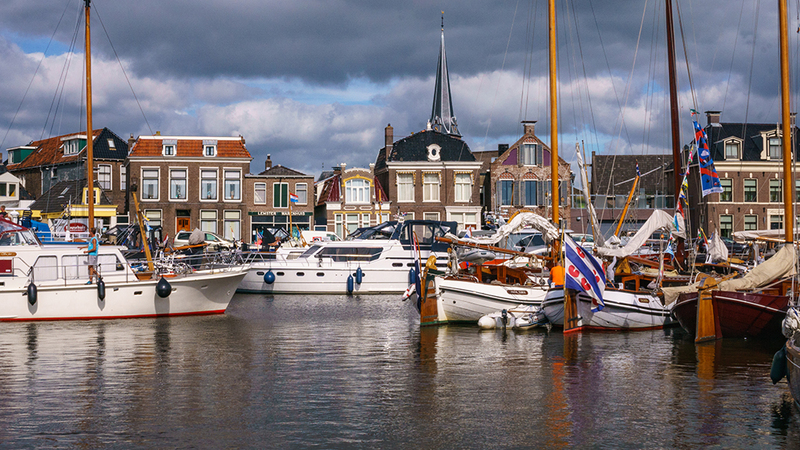 The city of Harlingen is very famous within The Netherlands for the Harlinger Visserijdagen (Fishery Days). It is meant to promote Harlingen and the fishing industry. While that might sound boring to some of you, I can assure you it is anything but. There is music, folklore, art shows and much more. Besides the Visserijdagen, Harlingen has a lot to offer. 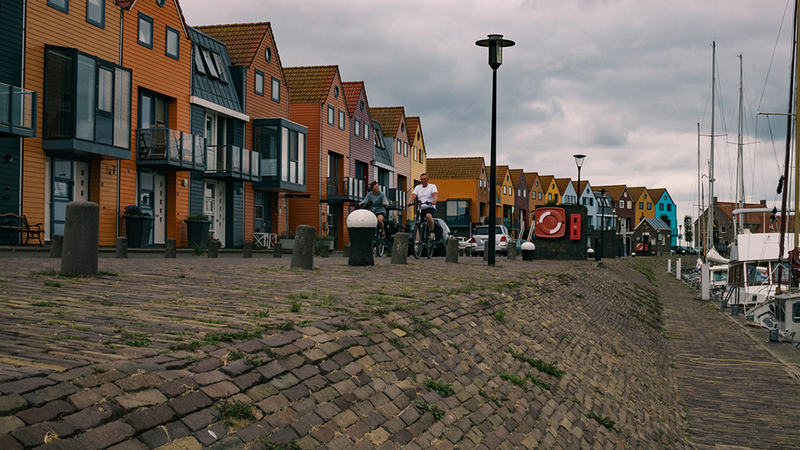 The city of Harlingen is located at the Wadden Sea (Unesco World Heritage Site), that made it a very important fishing city in the early days. That’s why the city is so old and beautiful, but that’s also the reason why there are plenty of things to do in Harlingen and surroundings. Getting to Harlingen from Leeuwarden is very easy. Just take the train from the train station of Leeuwarden in the direction of Stavoren. Get out at Harlingen station. This will take you about 22 minutes. When people, even Dutch people, think of visiting Friesland, Ijlst is somehow easily left out. And that while it’s one of the 11-cities. So, if Dutch tourists can’t seem to find Ijlst, let alone foreign tourists. Which is perfect for me, because I had the city to myself when I visited. The city is, again, small, but has this charm that I cannot explain. Ijlst got its borough rights in 1268 and has a little river flowing through the city centre. One of the highlights of Ijlst are gardens that are situated across the street on the bank of the little river. Their gardens are called ‘overtuinen’. And although nowadays people (the owners, not random people) sit in their gardens, sometimes you have the chance to get into the gardens as well. Once a year there is a market which leads you buying and eating your way through all the gardens. But don’t worry if you think this is all that Ijlst has to offer because that’s not true. Take the train in the direction of Stavoren from Leeuwarden station. Get out at Ijlst. This will take you about half an hour. I made you enthusiastic about Ijlst? Good! If you click here you will find an article to all the things you should do in Ijlst, including tips for accommodations and where to eat. Allingawier is a very small village in Friesland not too far from Bolsward, and worth a visit. The surroundings of the museum are already one good reason to go. You will see meadows, more meadows, and some more meadows. The reason I am suggesting you go to Allingawier is that Allingawier actually has a very big part of the village that is turned into a museum. Here you can see how people worked and lived years ago. It was interesting to see, and you can even buy specialties such as cake that has been made the original way, from local ingredients. The museum isn’t busy, yet, but some tours want to start visiting the museum. Which I’m happy about because a friendly volunteer told me about how the museum is sometimes struggling. The reason? It doesn’t get money from the government. The entry ticket is only 4,50 euros. Take bus 192 in the direction of Bolsward from Leeuwarden bus station. Get out at bus station Bolsward. Transfer and take bus 96 in the direction of Kop Afsluitdijk. Get out at bus stop Allingawier, Allingawier.Or you can take bus Qliner 350 in the direction of Alkmaar Station from Leeuwarden. Get out at Kop Afsluitdijk, Zurich. Transfer. Get into bus 96 in the direction of Bolsward. Get off at bus stop Allingawier, Allingawier. Both routes will take you around 50 minutes. So, if you want to spend a little bit of money to help the museum towards the future and to learn about the Frisian history of this region, Allingawier is the perfect place to go to. Have a look at an article I created here. Workum is, like many other Frisian cities, surrounded by water. But Workum has a little bit more than that. On one side Workum is surrounded by the Ijsselmeer and the other side the Friese meren. This makes Workum the ideal place to go sailing, canoeing, swimming, kitesurfing, etc. But, that doesn’t mean that is all Workum has to offer. Because Workum is one of the 11-cities, that means it is gorgeous. The best part is that you will find little boutiques, shops, and cafes everywhere. Forget about H&M or Zara, at least this time you will get an item that no one else has. Take the train in the direction of Stavoren from Leeuwarden. Get out at Workum station. From there it’s a bit of a walk to the city itself, but in 15 minutes you will be able to get there. The train ride itself is around 40 minutes. 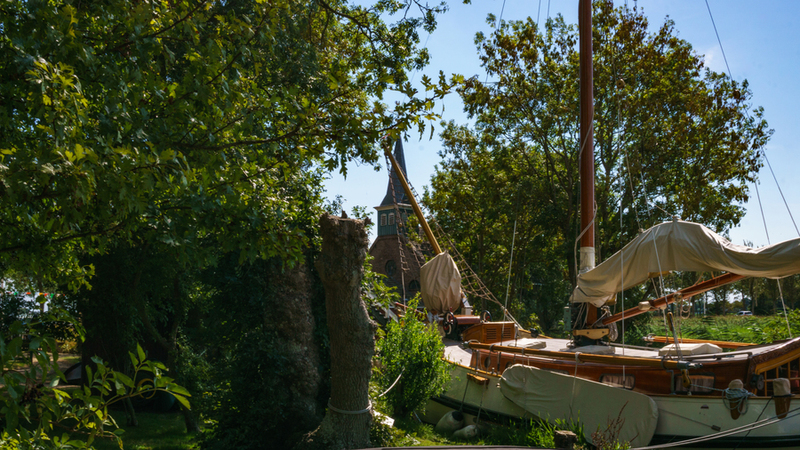 If you want to discover Workum and am looking for the best things to do, then have a look at an article I created about spending one day in Workum Friesland here. Makkum is another Frisian city that is located at the Ijsselmeer, which makes walking along the dike a more beautiful experience than usual. Makkum is known for having a beautiful city with, of course, canals, a great beach and for Makkumer pottery. That doesn’t sound too bad right? In the 18th century fishery and pottery were the main income; but, nowadays Dutch and German tourists like to spend a day in this area. That doesn’t mean that Makkum will feel crowded. It doesn’t. The city feels calming and rough at the same time. Take the bus Qliner 350 in the direction of Alkmaar from Leeuwarden bus station. Get out of the bus at Kop Afsluitdijk, Zurich. Take bus 96 in the direction of Bolsward. Get off the bus at Dominee L. Touwenlaan, Makkum.Or you can take bus 92 in the direction of Bolsward from Leeuwarden bus station. Get out at bus station Bolsward and take bus 98 in the direction of Makkum sporthal. Get out at Dominee L. Touwenlaan, Makkum. Not many people have heard of Aldeboarn. If I can describe the village in one word, it’s CUTE. Honestly. And Idyllic. That makes it two words. But , this is together with a few other cities and villages from this article, one of my most favourite day trips from Leeuwarden, The Netherlands. The village is very small, but at the same time very old. It was first written down in 753. Absolute zero tourists, I can say that. In the previous places, I’ve seen a maximum of four tourists, but this has been zero. Until now, because I assume you’re going to visit Aldeboarn. Take the train from Leeuwarden in the direction of Meppel and get out at Akkrum. Take bus 11 in the direction of Drachten Transferium. Get out at Súdkant, Aldeboarn. This will take you half an hour. You can also cycle from Akkrum trainstation to Aldeboarn which will give you much more freedom. This will take around 15-20 minutes. Make sure to rent a bike in Leeuwarden and buy yourself an extra trainticket in the machine for your bike. You can only take your bike in the train before 6:30, 9:00 – 16:00 and 18:30- 6:30. If you want to read what things you can do in Aldeboarn (Oldeboorn), The Netherlands. Then click this link to an article I wrote. Hindeloopen is also one of the 11-cities and got their rights in 1225. Hindeloopen is famous for the typical paintings and the beautiful, colourful, traditional costumes. One of my most favourite things to do in Hindeloopen, Friesland is walking on the dike. The reason for this is that Hindeloopen is placed behind a dike as the Ijsselmeer (a big lake in the middle of The Netherlands) is behind the dike. So, you will walk between sheep, with a view of Hindeloopen on one side and the Ijsselmeer on the other side. Trust me, you want to see that view. And about the sheep leave them alone, I saw a guy who wouldn’t leave the sheep alone even when they walked away. I spoke up, I thought he got the point and walked away. Five minutes later, he did the same thing. Don’t be that tourist. Please. Take the train from Leeuwarden in the direction of Stavoren. Get out at Hindeloopen. From the station, it’s a 15-minute walk to Hindeloopen itself. 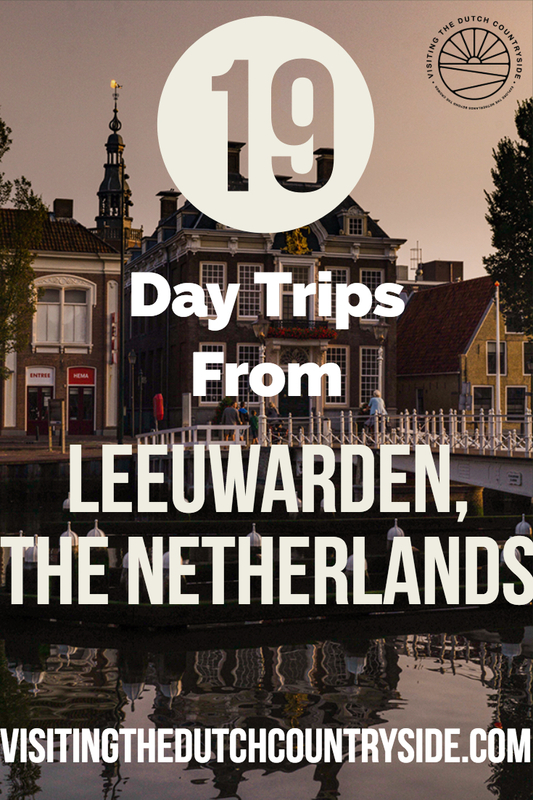 This has to be one of my favourite day trips from Leeuwarden, The Netherlands. If you want to visit a small town, that is beautiful and one that has a (small, but great) farmers market then Woudsend is your town. It is a bustling place yet feels calming at the same time. 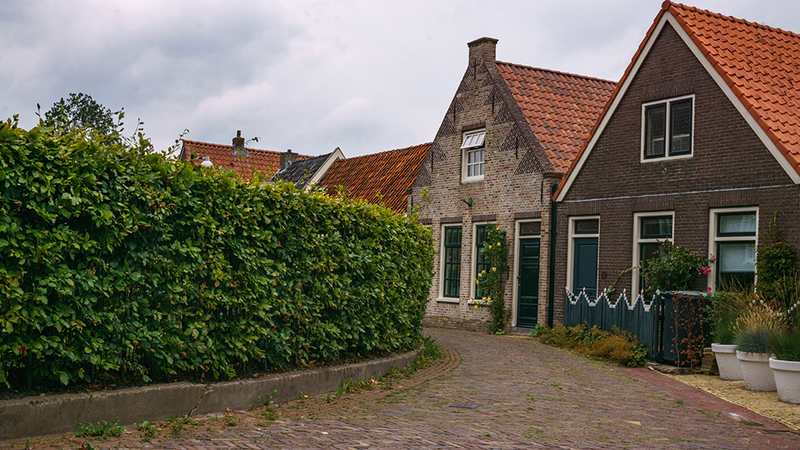 I was actually surprised at the number of things I could explore and do in Woudsend, Friesland. If you have the time, go for a drink at one of the few cafes and restaurants that are located near the river that divides the town. Also, Proeflokaal de Klerk has local dishes on the menu, so have a look for them as well. Take the train in the direction of Sneek from Leeuwarden. Get out at Sneek and take bus 45 in the direction of Hemelum Flinkeboskje. Get out at Centrum, Woudsend. Instead of bus 45, you can also take bus 47 in the direction of Lemmer and get out at Centrum, Woudsend. If you have heard of ‘Het vrouwtje van Stavoren’ (the women of Stavoren), then you might have researched this city before. Stavoren was the first Frisian city that got its borough rights and is famous for the statue of Het vrouwtje van Stavoren. This statue was actually placed there after a famous saga that might or might not have been true. The city of Stavoren, Friesland feels mysterious and rough to me. But that is something that attracted me to the city. The city centre has bridges and canals, and at one side of the city, there is a beautiful beach which is perfect for windsurfing. Take the train from Leeuwarden in the direction of Stavoren. Get out at Stavoren train station. This will take you around 55 minutes. Akkrum is a city that lays very close to Aldeboarn. In fact, I cycled from Akkrum to Aldeboarn and back because it was so close (and a better way to explore both places). This city has a small, but the adorable centre and a weekly market. For buying fresh cheeses, new socks or fresh veggies on a market in a cute town, Akkrum is your place to be. I wouldn’t go here for a full day, you’ve seen the village in a small amount of time. However, combine it with Aldeboarn and all the things you can do there and you’re settled. Besides that, Akkrum is the ideal place for typical Frisian events such as slingeraap. Slingeraap participants need to run to grab a rope. With that rope, they are flying over a little river and hope to land as far as possible. If you want to see typical Frisian traditions, Akkrum is the place for you. Take the train in the direction of Meppel from Leeuwarden. Get out at Akkrum. This journey will take you around 15 minutes. The small city of Balk is famous for its butter and ‘boterkoek’. Boterkoek is butter cake and something you have to try in Balk when you’re there. So put boterkoek on your foods to try list for Friesland. You can get it at Bûterhûs. As Balk is a very small place, the most beautiful part of the city is not big at all. Still worth a quick visit though, especially for the typical Frisian foods such as boterkoek. Every year there is an art exposition alongside the main canal of Balk. Pieces of art are placed inside, above and on the side of the canal. The city is very lively and has a very welcoming atmosphere. Take the train from Leeuwarden in the direction of Sneek. Get out at Sneek. Take bus 47 in the direction of Lemmer and get out at Meineszleane, Balk. Or you can take the train from Leeuwarden in the direction of Den Haag and get out at Heerenveen. From Heerenveen take bus 41 in the direction of Balk Harich Rotonde. Get out at Meineszleane, Balk. This will take you around one hour and 10 minutes. This is the perfect town for the water sports junkie. Sailing? You got it. Renting a boat? Absolutely. Canoeing? Of course. And much more. Heeg has acquired this status because it is definitely one of the best places of Friesland for water sports. That also means that Heeg is somewhat more crowded. But at the same time, the old and authentic feel doesn’t go away. It is a bustling, little town, with lots of people who wear sailing clothes. You don’t need an entire day in Heeg if you’re not going to sail, or something else that has water involved. In that case, I would recommend you take a trip to both Heeg and Woudsend as these places are close by. Combining several small and cute cities in one day trip from Leeuwarden is the perfect solution for that. Take the train in the direction of Sneek from Leeuwarden. Take bus 46 in the direction of Oudega and get out at De Skatting, Heeg. This will take you approximately 50 minutes. 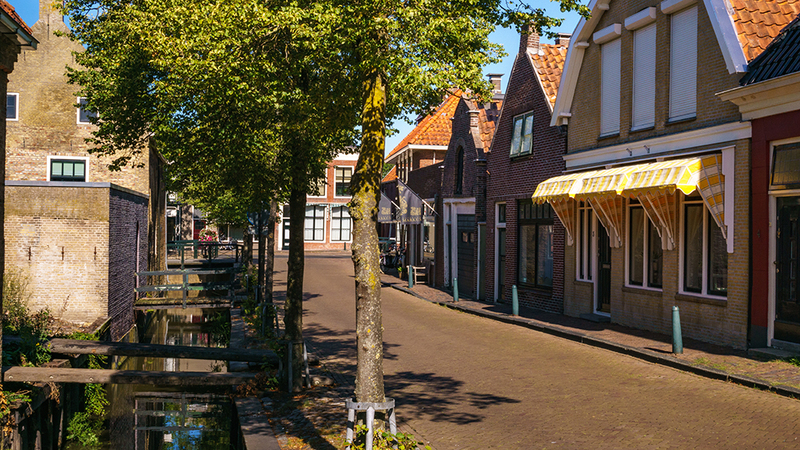 Snits, aka Sneek, is most known within The Netherlands for Sneekweek. During this event, there are for one week a lot of sailing races. While the rest of the visitors rent a boat to see the races, the competitors are fighting hard for their spot. But, once the evening comes along the biggest competitors are friends again. The reason? Every evening during Sneekweek there are parties throughout the entire city. 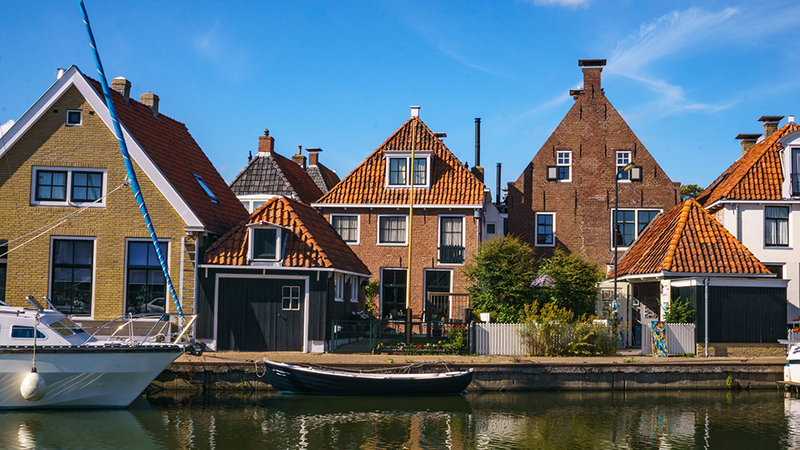 If you have the chance to visit Sneek, The Netherlands during Sneekweek you have to take the opportunity. 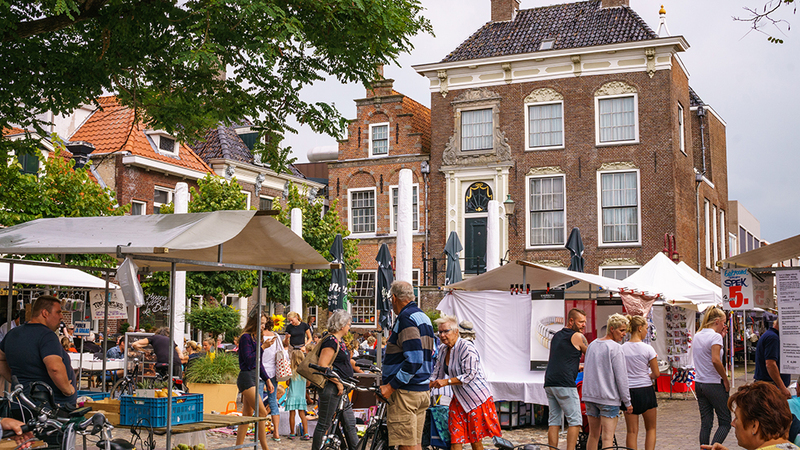 Besides Sneekweek, Sneek has a lot of things to offer for visitors. From museums to beautiful streets. 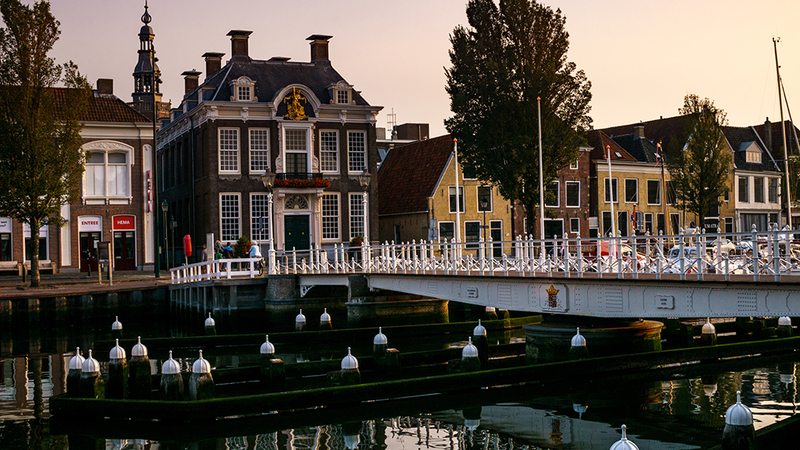 As Sneek is one of the 11-cities as well, there is no reason for Sneek not to be worth a visit. Take the train from Leeuwarden in the direction of Sneek or Stavoren and get out at Sneek. This will take you around 20 minutes. This city is known for its ice-skating hall, Thialf. This is where many national, European and world championships of speed skating have been held. And this is one of the ice skating halls in The Netherlands where the best speed skaters train. But, you can also visit it and skate on the ice. Ice-skating is something you shouldn’t miss out on when you are traveling to The Netherlands. And what best way to ice-skate than in the footsteps of legends?! Don’t worry. Ice-skating is not all that Heerenveen and its surroundings have to offer. There is much more to explore. If you do want to go ice-skating, keep in mind that during the summer it’s not opened. Take the train from Leeuwarden in the direction of Meppel or Den Haag Centraal and get out at Heerenveen. This will take you around 15 minutes. As another city that belongs to the famous 11-cities tribe. 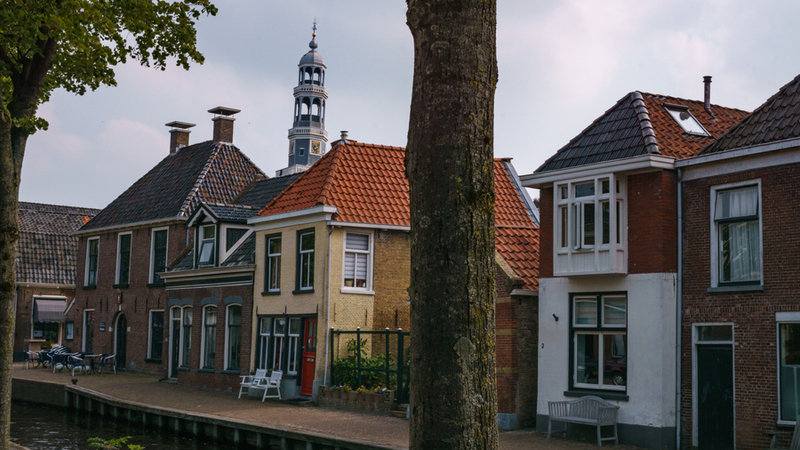 The reason why Dokkum is famous outside The Netherlands is that Bonifatius was murdered in the surroundings of Dokkum in 754. 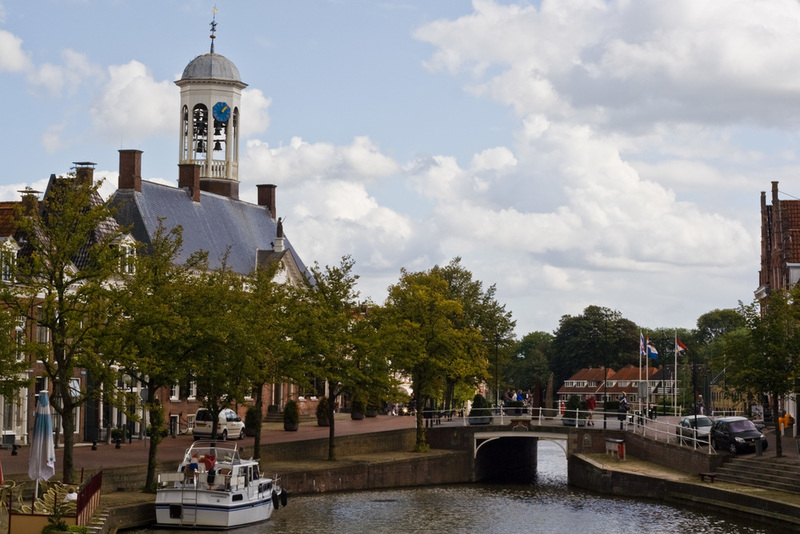 Yet, not that much foreigners visit Dokkum so don’t worry about entering a crowded city. And if there is a crowded place, walk away from the Bonifatius statue and you’ll have the city to yourself again. 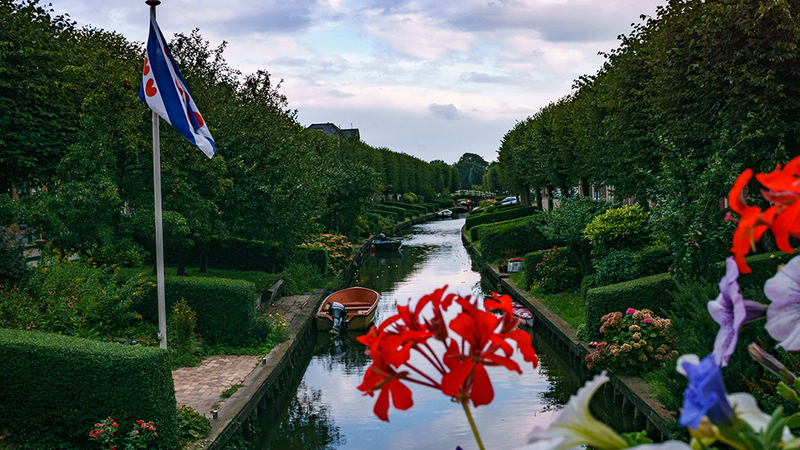 Dokkum is one of the best cities of Friesland, The Netherlands and thus one you have to visit. And if you are a coffee lover, you will love Dokkum. You have to enter a café that has the real Dokkumer coffee. That will make visiting Dokkum the best day trip from Leeuwarden you have ever done. You won’t be disappointed. I’m not a coffee fan myself, but, I know many people who are, and they love the Dokkumer coffee. Take bus 51 in the direction of Dokkum, get out at Woudpoort, Dokkum. Or you can take Qliner 355 in the direction of Dokkum and get out at bus station Dokkum. The routes will take you between 40 and 50 minutes. One of the best day trips from Leeuwarden is Franeker. The last city of the 11-cities that you will see on this list. One thing you cannot miss is the world-renowned planetarium. It is the oldest, still working, planetarium in the world. Truly astounding how people can create something like this. 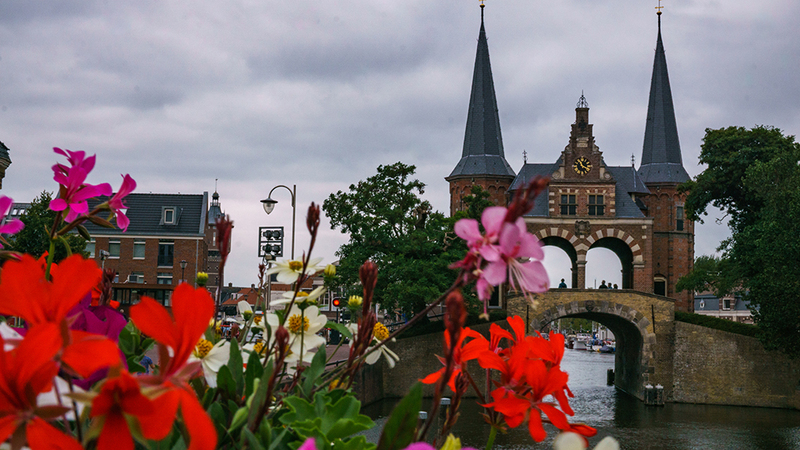 Besides the planetarium, there are many other things you can do in Franeker. As it’s a old city, strolling through the beautiful streets can already fill up a day. Or visit the oldest sports museum in The Netherlands. There are endless options. Take the train from Leeuwarden in the direction of Harlingen, get out at Franeker. This will take you 15 minutes. Note: Most buses go once, or at most twice an hour. Some trains (the one to and from Stavoren) also go only once an hour. Keep that in mind. Always check 9292 for the timetable, price and when the first and last buses/trains run. Go to 9292 right here. If you were wondering where the last city of the 11-cities of Friesland, The Netherlands is. In the beginning I wrote that Leeuwarden is also one of the 11-cities. And if you are researching the best day trips to take from Leeuwarden, The Netherlands, then I suppose you already know of Leeuwarden’s existence. I hope this article has been helpful to you and that you want to visit more of Friesland than just traveling to Leeuwarden. As you can see, Friesland has plenty of things to do. From must-see places, tourist attractions, plenty of day trips from Leeuwarden and points of interest. Have you heard of any of the cities that I have covered in this article? Or have you been to any of these cities and villages already? Is there a village or city you’d like to add? Click this link to have a look at all my articles. Share this post! !